Reunited with their leader Grant McKay, the Anarchist League of Scientists dive deeper into the Onion than ever before. Now veterans of inter-dimensional travel, the team begins to realize how damaging their actions are on the fabric of reality. No longer content with merely fixing the Pillar and finding a way back home, they vow to uphold a new ideal: leave every dimension they visit better off than how they found it. Their idealism is put to the test, as infighting and conspiracy within the group put not only themselves, but all of the Eververse at risk. As Grant struggles to keep his children safe, he begins to see the cracks in his team's commitment and trust towards one another. Just as he wanted to use the Pillar to achieve his dreams and hopes, so, it seems, did everyone else. And he has no idea how far some people are willing to go to see their ambitions met. Beset by dangers from all sides, the League barrels through dimension after dimension, struggling to do good, but nevertheless heading straight towards catastrophe! 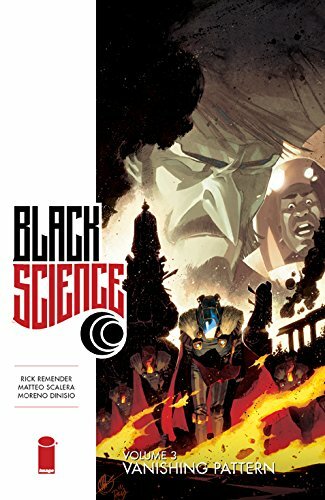 The juggernaut creative team of writer Rick Remender and artist Matteo Scalera return to deliver the most thrilling and vibrant arc of Black Science yet, combining dark and fascinating character drama with mind-bending sci-fi pulp action and gorgeously rendered visuals to deliver one of the most fast-paced and exciting monthly comics on the stands. Collects Black Science (2013 Image) #12-16. Softcover, 128 pages, full color.